Here are some Hypermiling tips you can use right away! 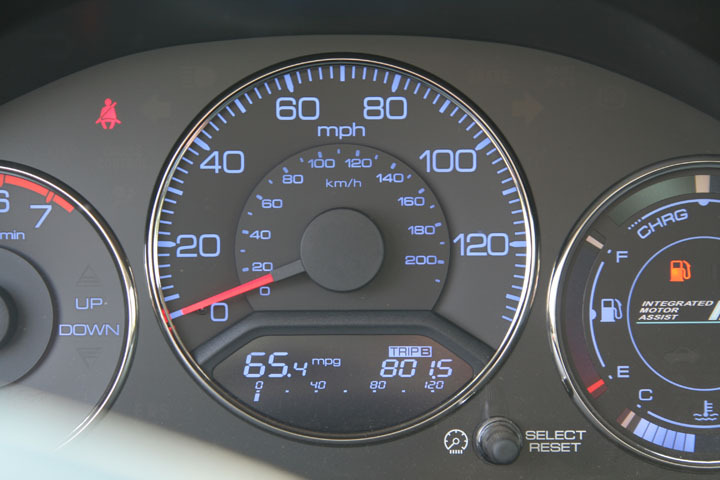 Do not accelerate quickly or brake heavily: This reduces fuel economy by as much as 33 percent at highway speeds and 5 percent around town. EPA tests do not account for this kind of vigorous driving. Do not idle if not necessary: Decreases average FE. The EPA city test includes idling and in many cases, it is not necessary. Consider shutting down your vehicle if stopped for more than 7-seconds as that is all the fuel it takes to restart a modern day, fuel-inject engine. Avoid driving at higher speeds: This increases aerodynamic drag (wind resistance) and mechanical friction which reduces fuel economy. The EPA test accounts for aerodynamic drag up to highway speeds of 60 mph, but most exceed that speed far more often then necessary. Cold weather and frequent short trips reduce fuel economy, since your engine doesn't operate efficiently until it is warmed up. In colder weather, it takes longer for your engine to warm, and on short trips, your vehicle operates a smaller percentage of time at the desired temperature. Note: Letting your car idle to warm-up does not help your fuel economy, it actually uses more fuel and creates more pollution. Drive to your furthest destination first and then as you are heading home, stop at the closer destinations in order from furthest to closest as the car is warmed up for longer portions of your drive. Remove Cargo or cargo racks: Cargo and/or racks on top of your vehicle (e.g., cargo boxes, canoes, etc.) increase aerodynamic drag and lower FE. Vehicles are not tested with additional cargo on the exterior. Do not tow unless absolutely necessary: Towing a trailer or carrying excessive weight decreases fuel economy. Vehicles are assumed to carry three hundred pounds of passengers and cargo in the EPA test cycles. Minimize running mechanical and electrical accessories: Running mechanical and electrical accessories (e.g., air conditioner) decreases fuel economy. Operating the air conditioner on "Max" can reduce MPG by roughly 5-30% compared to not using it. Avoid driving on hilly or mountainous terrain if possible: Driving hilly or mountainous terrain or on unpaved roads reduces fuel economy most of the time. The EPA test assumes vehicles operate over flat ground. Do not use 4-wheel drive if it is not needed. 4-Wheel drive reduces fuel economy. Four-wheel drive vehicles are tested in 2-wheel drive. Engaging all four wheels makes the engine work harder and increases crankcase losses. Maintain your Automobile: A poorly tuned engine burns more fuel, so fuel economy will suffer if it is not in tune. Improperly aligned or under inflated tires can lower fuel economy, as can a dirty air filter or brake drag. Selective Flushing - you don't have to flush every time! You don't have to flush the toilet after every use. Follow the saying "if it's yellow, let it mellow, if it's brown, flush it down!" We personally attest that this concept can prevent 50-75% of flushes. 1) Communicate the importance to everyone in the household, so there is no confusion on why others aren't flushing. 3) Leave an air freshener in the bathroom, if odor is a concern. 4) Flush when company comes over, if you are concerned by what they might think (or explain it to them, maybe they'll agree it's a good idea).